PLT’s state of the art PreK-8 curriculum materials are packed with inter-disciplinary activities, each tailored to specific grade levels and learning objectives. These materials provide educators the tools they need to bring the environment into their classrooms – and their students into the environment. In The Changing Forest: Forest Ecology module, students examine ecological systems of a forest; analyze interdependencies within a forest ecosystem; and explore factors, like fire, that shape the development of forests. In addition, they develop critical thinking skills and discover the importance of scientific analysis when making decisions about forest issues. Exploring Environmental Issues: Focus on Forests module uses forest related examples to help students better understand the complexity of environmental issues. Students examine issues objectively, collect and analyze data, and become involved in decision making experiences. They learn how to present arguments clearly and how citizens can play a role in forest management decisions. Through the Exploring Environmental Issues: Municipal Solid Waste module, students begin understanding waste management issues and options. The module uses hands-on experiences to show the interrelationships among waste generation, natural resource use, and disposal. The activities guide students through waste management strategies and solutions while providing the necessary tools to make informed decisions and choices on waste management issues. Exploring Environmental Issues: Focus on Risk module helps students explore the different aspects of environmental and human health risks that affect their everyday lives. It incorporates science, social studies, math, geography, and language arts. The module is designed to be infused into existing curriculum and is correlated to the national science standards. Through eight hands-on activities, students analyze, explore, discover, and learn about risk assessment, risk communication, risk perception, and risk management. In addition, there are three special topics that encourage students to apply the knowledge they develop from the activities to actual risk issues. Critical thinking, problem solving, and decision making are stressed throughout the activities. All communities – urban, suburban, small town, rural – are experiencing growth and change, which has an impact on each community's environment. PLT's module, Exploring Environmental Issues: Places We Live, provides educators with a useful tool for place-based education to help create a bond between young citizens and their communities. Students will explore current and future community environmental issues, enabling them to make informed decisions about those issues. This secondary module uses biodiversity as a window through which secondary students investigate the environment. It permits educators and students to step back from specific issues and species and to examine broader concepts and larger connections—not just biological, but political, cultural, ethical, and economic as well. Students will learn that decisions about growth and development, about energy use and water quality, even about health, all rest to some extent on perspectives about biodiversity. Developed by Project Learning Tree and the World Forestry Center Forests of the World provides formal and nonformal educators with a series of activities to help students and educators gain an increased understanding and appreciation of the diversity of world forest environments, with an emphasis on the human interaction with and dependence on those environments. The module activities provide students with opportunities to apply scientific processes and higher order thinking skills while investigating world forestry issues and conducting service learning action projects. 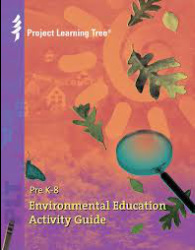 PLT's Energy & Society program kit provides formal and nonformal educators with tools and activities to help students in grades PreK-8 learn about their relationship with energy and investigate the environmental issues related to energy's role in society. Energy & Society helps students develop critical thinking skills to make decisions about their personal energy use. In addition to hands-on activities, Energy & Society integrates music and dance to enhance the study of energy issues. * A background section for educators. A new supplement to the Risk module this curriculum goes over artificial selection and the process of creating Genetically modified Organisms. Then students explore how these technologies are used and the issues surrounding this technology.